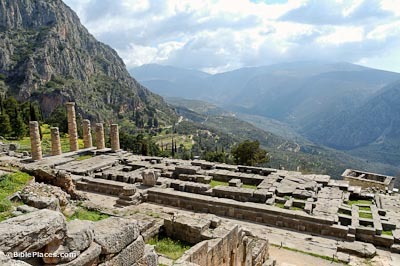 The site of Delphi served as a cultic center beginning some time before the 10th century BC. Votives were used ca. 800 BC and within a century the oracle of the priestess Pythia came here. When the cult of Apollo Delphinios (worship of an island deity in dolphin form) was brought to the region from Crete, the city acquired its name “Delphi.” After the Dorian Invasion in 1100 BC, the sanctuary at Delphi became the center for the Amphictyonic League, a group of 12 tribes representing city-states throughout the surrounding regions. 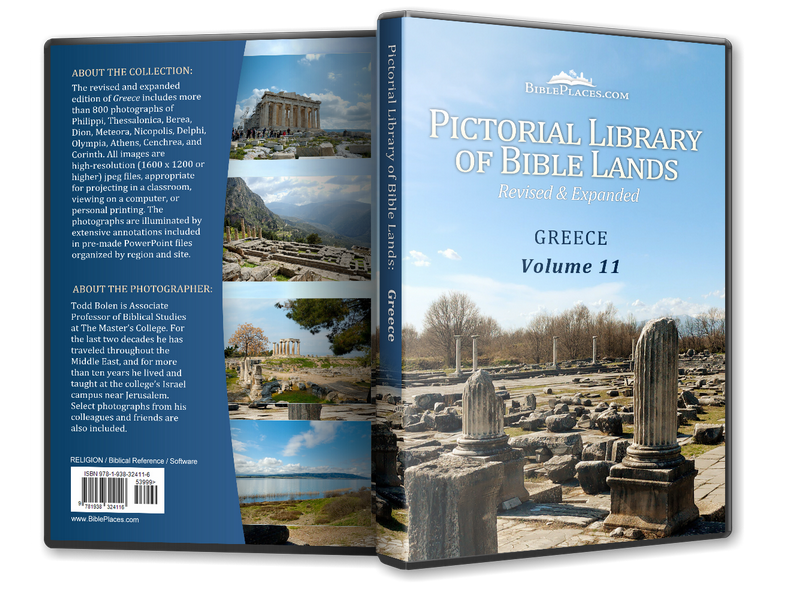 It included Thessalians, Achaeans, Ionians, Dorians, and cities such as Athens and Sparta. The Temple of Apollo was first built in the 7th century BC. Fire destroyed this structure in 548 BC, and a larger structure replaced it, constructed from 536-505 BC. Some remains of that temple have been found, including the pediment, although it was destroyed in 373 BC. 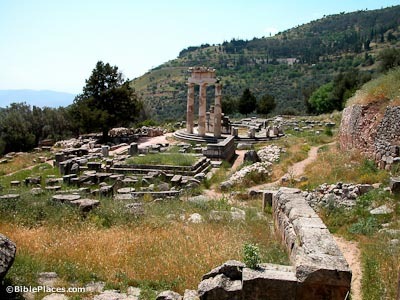 The temple whose remains can be seen today dates to the mid- to late-4th century BC. Xenodoros and Agathon built the Doric peripteral temple, fired by Thracian invaders and Sulla in the 1st century BC., but Domitian repaired it. In the Middle Ages, the metal clamps were stolen and the temple left in disrepair. The temple was restored in 1939-41. 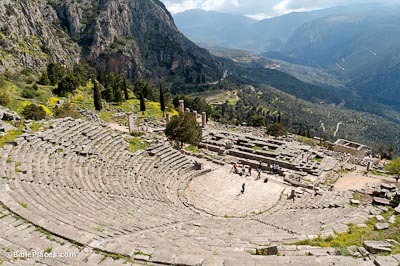 The theater is quite well-preserved, dating to the 4th century BC. Eumenes II of Pergamon restored it in the 2nd century, as did the Romans later. It was used for musical and theatrical portions of the Pythian Games and for meetings of Delphian citizens. Thirty-five rows provided seats for 5000 spectators as well as an excellent view overlooking the Temple of Apollo. 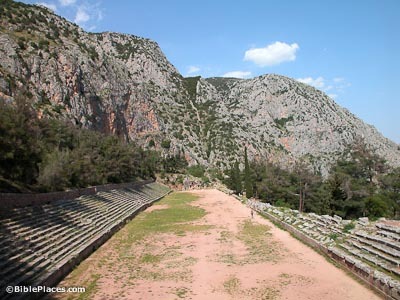 The Delphi stadium was located at the highest part of the city, partially cut into the rock. It originally sat down on the Delphian plain but was moved to this position in the 2nd and 3rd centuries AD. The track was 600 Roman feet long and could hold 17 or 18 runners. Starting in 591 BC, the athletic portions of the Pythian Games were held here every eight years, commemorating Apollo’s slaying of the serpent Python. The stadium could seat about 6500 spectators. 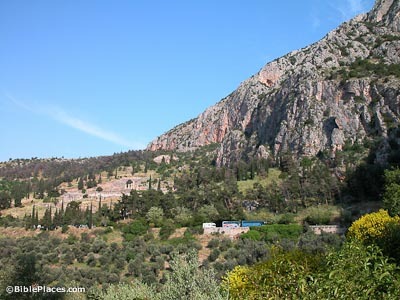 The Marmaria was the Sanctuary of Athena, who was considered to be the guardian of the temple. It included several structures, including the temple of Athena Pronoia and the temple of Athena Ergane. This tholos, or rotunda, was built in the early 4th century BC by the architect Theodoros. Twenty Doric columns surrounded a three-stepped platform. These three columns, reconstructed in 1938, show what the tholos would have looked like when it was still standing.